Standard - $54.99 Only 1 left! 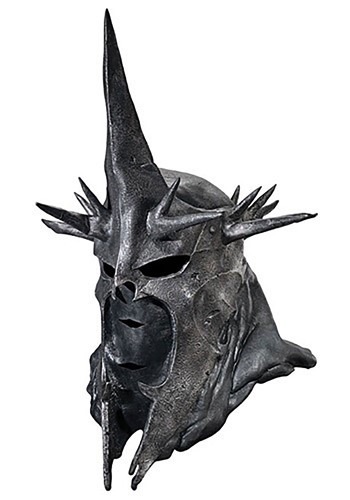 You'll feel the pull of the One Ring in this licensed Witch King mask from the Lord of the Rings. The mask is designed to completely conceal your face so that you can step into the role of this truly fearsome character, instantly transforming you into the Black Captain. Lord of the Rings fans will be completely jealous of just how authentic you look, compared to their close enough costumes, yours will look almost exactly like the one from the cinema. Even if those you encounter throughout the night have never seen The Lord of the Rings and aren’t quite sure how the Witch King of Angmar is that ok! You will still look killer in this, it is still quite the creepy design. Silver distressed detailing will make it look as if you just stepped off the battlefield, fighting against all that try to cross you. This mask was just what I wanted for my Witch King costume. I wore a black balaclava under it to keep my mouth and chin from showing through the mesh, but otherwise this needed no help. Great item.